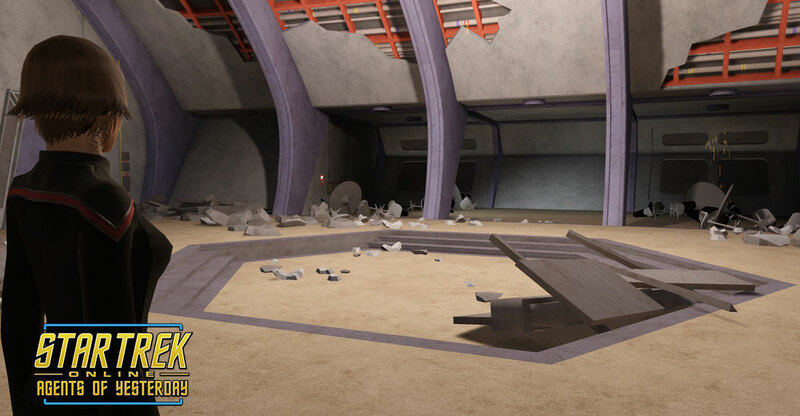 Captain Ezri Dax considered Starbase Deep Space K-13 on the viewscreen as the U.S.S Aventine approached the time-lost relic. Repair shuttles and environment-suited work crews worked steadily over the hull, replacing and repairing critical components. It would take some time, but the station would be functional once more. According to recently filed situation reports, the station was nearly destroyed by an asteroid in recent times. A Federation relief ship was dispatched to assist the beleaguered starbase, even though the chances of it arriving in time to help were remote. Fortunately, the station’s inhabitants solved their asteroid problem with some 23rd century ingenuity. While their equipment was somewhat out of date, their cleverness and determination were certainly up for the challenge. Keeping them from killing each other – well, that was another challenge entirely. Like the station itself, the people on board were products of another time. While new skills could be trained and the numerous advances in technology explained, eliminating old prejudices was proving difficult. That was still an issue in modern times, as any commander of a multi-faction Alliance force could testify. She’d had to break up a brawl between Federation and Klingon forces during a recent visit to Deep Space Nine (and had the bruises to prove it). Still, the Starfleet and Klingon inhabitants of K-13 had worked together to save the station, so there was some hope for them yet. “Aye, Captain,” the helm officer said, rising to sit in the command chair while her relief took over minding the Aventine’s navigational controls. Ezri made her way to the turbolift. The Aventine not only brought much-needed supplies and engineers to assist in repairs on the station, they also brought counselors to offer support. Her time as a counselor on DS9, along with the considerable experience of her previous hosts, made her a prime candidate to lead the counseling efforts on this mission. She’d read reports from encounters with individuals who'd been in stasis for an extended period of time. They indicated that such individuals could be traumatized by culture shock after revival. In Klingons that could be... explosive. Fortunately, she had considerable experience in dealing with Klingons as well. Ezri’s first officer was waiting for her when she stepped out onto deck twenty, a short distance from where the Aventine’s transporter room was located. “Commander T’Vai,” she said, greeting the Vulcan as she continued down the hall. “Captain.” She inclined her head and fell into step with Ezri. “You’ve had a chance to look into K-13’s history and the report from the people first on the scene here. What is your analysis of the situation?” Ezri asked. T’Vai’s background was as a xeno-anthropologist. History was important in understanding motivations and Ezri was thankful once more for her first officer’s expertise. “The Klingons are a traditional people, as you have experienced,” T'Vai observed, arching a dark eyebrow. Ezri nodded in agreement, a hint of a smile creeping out. Oh, yes. Indeed I have. She’d befriended many Klingons in her lifetime, as had several of her previous hosts. Their collective memories included more than a century of Klingon history and culture. Tradition, to them, was a cornerstone. Not entirely unlike Vulcans, Ezri thought with a sideways glance at her XO. “Change does not come easily to the Klingons, but once it is embraced it is done so… vigorously,” T’Vai said, very diplomatically. Ezri chuckled. “The Klingon heart, if nothing else, is a ‘vigorous’ thing. That tracks with my experiences. Initial resistance, and then commitment if the idea proves sound - and honorable.” Earning the respect of a Klingon could be difficult. Earning their friendship was harder still, but once earned – well. There were fewer beings more loyal in Ezri Dax’s opinion. She'd been giving a lot of thought to the matter since she'd been tasked with assisting the time-lost crew of K-13. “I look forward to her report,” Ezri said as they arrived at the transporter room. She stepped onto the transporter pad and turned to face the XO. "I leave the ship in your capable hands, Commander. Call if something comes up." "Aye, Captain," the Vulcan said. She bent to the transporter controls and sent her captain over to assist in a very different sort of repair onboard K-13. Beaming into the central hub of K-13 brought back a flood of memories from a life Ezri had not led. Curzon Dax had lived in the 23rd century, and the shapes, colors, sounds and even smells of the ancient station threw her back into the past. Ezri smiled, briefly recalling the brilliant and talented Dr. McCoy, and looked around, orienting herself. It was, as her old friend Benjamin would have put it, 'a dump'. Oh, there had been efforts to collect some of the debris and clear space, but there were more important matters to attend to than the aesthetics of the hub area. At least the commissary area had been cleared, and she saw that some of the replicators were working. Broken consoles were being worked on by crew in modern Starfleet uniforms, but they appeared to be somewhat puzzled by the old tech. Men and women in the style of Starfleet uniform worn in 2270 looked up at her curiously as she beamed in, then returned to their tasks. Ezri turned to find a human in a mustard colored tunic with commander's bars on the sleeves. She held out a hand and smiled. "That's me. Commander O'Ryan?" He smiled. "Guilty as charged. Thank you for coming and dealing with the-“O’Ryan paused and nervously ran a hand through his thinning red hair. "Situation." Ezri's smile fell a little. "Situation?" "Yes." He stepped in closer and dropped his voice. "For one, I have some concerns about my chief- my former chief engineer. Your CMO is looking in on him now." "He is the one suffering from stasis-induced psychosis?" O'Ryan nodded. "And for another, well, the Klingons-” The commander was cut off as an angry roar and a crash sounded over by the replicators followed by angry shouting in Klingon. "Not again," O'Ryan sighed. Ezri found the two Klingon men facing off against one another, ready to fight. Others had risen from their seats or come closer. "This happens often?" she asked quickly. "More, recently. They were fine at first and then," he gestured helplessly. "I'll see what I can do," she said striding forward. "What is this?" she called out as she stepped boldly into the area, startling Klingons and humans alike. "Who is in charge here?" "I am," a tall Klingon warrior said. His brow hardly showed the usual ridges of his species, and he wore the Imperial uniform common in 23rd century. "I am Commander Krom," he said, drawing himself up. "And who are you?" His eyes narrowed as he looked her up and down. "What are you?" Ezri grinned back, flashing a little bit of her teeth. "Ezri Dax, Captain of the Aventine." "Is that supposed to impress me?" Krom said, looming over her. "I would expect an honorable Klingon to have some respect for the rank, if nothing else," she replied. "Starfleet ranks alone do not impress me, alien." "And he has no respect for captains," someone in the back muttered in Klingon, unaware she could understand them. Several of the Klingons began to chuckle darkly. Krom's expression tightened slightly. "I'm a Trill," she said, not backing down. "A joined Trill. The Dax symbiont has been a friend of the Klingons for more than a century. I am here to help, if you are brave enough to face the challenge." She tossed that verbal gauntlet down in front of him with the sass and challenge she'd inherited from Jadzia Dax, and set her hands on her hips. "Another Starfleet officer mocks us," someone else muttered from the back. "Look how the Commander takes it," another voice said. Ezri was beginning to get a sense of what was going on to cause the disruption among the Klingons at least. Dissention in the ranks. Krom was in charge, but only a commander. Had their captain died? "Silence," Krom roared back at his people in his own language. He looked back at Ezri. "We do not need your help." "I don't know," she said. "You're suddenly in a time and place not your own. You're on a station controlled by people you have recently been at war with. Reasonable concerns for even the heartiest warrior." Krom growled. "Our business is none of yours, Trill." "Actually it is. I am here on behalf of the Alliance. Not just the Federation, but the Empire as well," Ezri said, noting the curiosity and surprise on the faces around her. "The Empire would not send one such as you," a Klingon lieutenant twice her height sneered at her. "Why not," she challenged back in Klingon, surprising the group. The lieutenant stepped back as she continued to speak. "I swear to you on the blood of my ancestors that I am as honorable as any of you. The High Council knows the name Dax. We have fought side by side and shed the blood of our enemies together." "Bah," the lieutenant said, apparently unimpressed now that he was over his surprise. "Bold words, easier believed from a Klingon. And I do not see the High Council behind you, woman." "Perhaps we should listen to this warrior, Toram," Krom said, addressing the lieutenant. "Perhaps we should stop listening to you," Toram replied. "You took away our chance at a glorious death and now we are little more than Federation slaves." Ah. So the captain had died at the hands of his second – Krom – and not everyone was happy about it. This was escalating quickly. Ezri wracked her brain to find a way to diffuse things fast. Failure meant someone was going to be hurt - or worse. "We could have taken the station with B’ram, or died gloriously trying!" Toram shouted. He turned his angry eyes on Ezri. "And perhaps we should take it still, and those ships outside! We can start by taking this pitiful excuse for a captain hostage!" Ezri saw him tense, and then lunge as if in slow motion. Decades of training across half a dozen lifetimes kicked in with a fluid grace. Calmly, she executed a defensive move on the raging Klingon. He overbalanced, and using his momentum against him, she sent the hapless young officer sailing over her shoulder to land in a pile of debris. He stared up at the ceiling, stunned but alive. Ezri waved down the security officers with drawn phasers and turned back to Krom. The Klingon looked impressed. So did some of the others. Good. I can work with that. "Your commander has wisely saved your lives," she said. "The Empire and the Federation are no longer at war. We are allies, fighting far more deadly and dangerous opponents together," she said. "There are dishonorable enemies out there who will wear your own appearance as a mask and hide in plain sight, only to sow chaos and discord. The Klingons were vigilant and saw this threat! The Federation was blind at first, but then we saw the truth!" she said, stalking around the group, holding their attention. "Together we fought beings of air and darkness! Creatures so powerful they could transport their entire fleet into the very heart of the Empire or the Federation in the blink of an eye." "Kahless the Reborn fought with us," she stated proudly, and that elicited murmurs from the Klingons as well as curious interest. "He single-handedly turned the tide of an Iconian assault! He and a brave team of warriors fought into the heart of the beast's lair. Defeating foe after foe, they made their way to where T'ket, their greatest warrior, commanded a mighty Iconian fleet. Though they knew it might well mean their deaths, it would surely mean the death of all on Qo’noS if they did not strike fast and true." She looked around, pausing in a bit of theater that was part of a good Klingon saga. And so Ezri told them of the final stand of Kahless, and of the might of the Klingon Empire at the final battle of the Iconian War. She spoke of Klingon bravery and valiance, and the glory and renown they had won fighting together with their comrades in the Alliance. "There is glory untold out there still," she said proudly. "This is a new age, with new opportunities. You have been saved so you can join your brothers and sisters in battles worthy of song!" Toram grunted but inclined his head to the commander in a way that indicated he wasn't going to pursue the issue at the moment. He went back to work. As if that was a signal, the spectators, all of them, began to go back to what they had been doing before. Ezri breathed a sigh of relief. She'd given the Klingons something to think about, and hopefully some reassurance that the Empire they knew and the Empire of today weren't so different. "Captain Dax," Krom said. "All of that was true?" Ezri smiled, a gentler one that didn't challenge. "On my honor, and that of my House," she said solemnly. "Every word is true." She gestured to the replicators. "How about we get a couple raktajinos and I answer any questions you might have?" Krom eyed her suspiciously for a long moment before grunting agreement. While it wasn't a resounding success, it was a start.